I want to buy what's cheap, hated, and in the start of an uptrend. The most important question to answer is, "How do you define these terms for different assets?" For example, how do you know that gold is hated? Defining "hated" is tough – as you are defining an emotional state, not a high or low number. And that works. For example, in the latest Bank of America Merrill Lynch Fund Manager Survey, gold sentiment hit a 17-year low among investors surveyed. However, it's what investors are doing that matters most. So surveys are good... But I prefer to look at "real money" on the line. 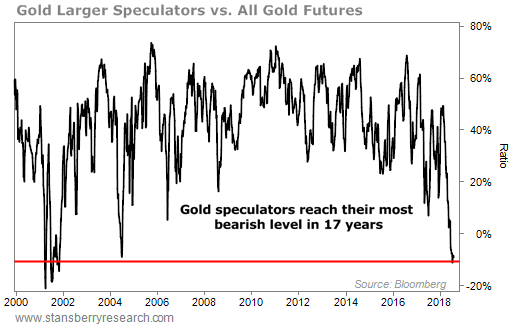 The best way to see what the real money is doing in gold is to look at what large speculators in the futures markets are doing with their money. For that, I look at the Commitment of Traders ("COT") report. It shows the real-money bets of futures traders. I look at a ratio of large-speculator bets versus all bets. Doing this somewhat "normalizes" history. You can measure today's bets against a longer time frame – for example, if you wanted to compare what's happening today with what happened 20 years ago. Currently, large speculators in gold futures have bigger bets against the gold price (relative to all futures bets on gold) than at any time since 2001. As someone looking for hated assets, this chart is EXACTLY what I want to see. It shows gold speculators are betting against gold to a greater degree than at any time since 2001. That's important... Gold's last great bull market started in 2001, from a similar degree of "hated." Back then – the last time gold was this hated – the major gold-stock index (the HUI Gold BUGS Index) soared nearly 300% in a little more than two years. In order to buy an asset at the best price, you want to buy it when it's hated and ignored. And you want to sell it when it's all over the news. Today, gold is hated. That's what the real-money bets are saying now. I expect today's gold extreme means that we are close to the start of the next great bull market in gold. P.S. I can't wait... The 2018 Stansberry Conference is just days away. And while it's too late to join us in person, you can still make sure you don't miss any of the insights and opportunities we share in Vegas. Just pick up an Online All-Access Pass... and you can participate from home, at a huge discount to the regular ticket price. This may be your last chance to get in on the action... So don't wait. You can find out more details right here. The COT report is a great contrarian tool for all sorts of assets. Earlier this month, Steve uncovered another sentiment extreme based on a recent report... Learn more here. 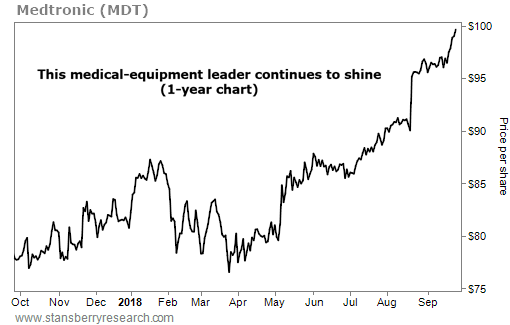 We can see this playing out today with Medtronic (MDT), a leading provider of medical devices and equipment. The $134 billion company operates in more than 150 countries and holds around 46,000 patents. Medtronic helps treat many of the conditions that are more common among older folks – like cancer, heart disease, and diabetes. In the most recent quarter, the company’s sales from diabetes treatment alone increased more than 27%.